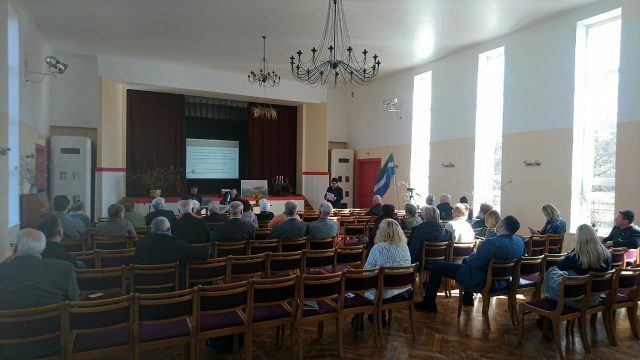 On the last Sunday in March, members from all four sections of the Livonian Union (Līvõd Īt) – from Rīga, Irē (Mazirbe), Kūolka (Kolka), and Ventspils – gathered at the Livonian Community Hall in Irē. 33 representatives had come together to reflect on all that had been accomplished and to speak about their hopes for the coming year. The head of the Livonian Union, Ieva Ernštreite, discussed the organisation’s most significant events and the projects which had been completed during the past year. She particularly emphasised the event at the Latvian National Library in Rīga celebrating the 95th anniversary of the Livonian Union, the extensive renovation of the roof of the Livonian Community House, the Livonian children’s and youth summer school “Mierlinkizt 2018”, the annual Livonian Festival in Irē, the opening of the new Livonian Meeting House in Kūolka, the Livonian homestead established in Tārgale, and, of course, an especially significant event – the inclusion of the Livonian cultural space into the Latvian National List of Intangible Cultural Heritage. A day before the meeting, everyone involved with nominating the Livonian cultural space for inclusion into the list was officially recognised at the Krape Community House. These included the Livonian Culture Centre (Līvõ Kultūr sidām) in cooperation with the Livonian Union, the Ventspils Livonian association “Rānda” as well as the several dozen authors of this idea (various organisations involved in work associated with Livonian culture and private individuals as well as legal entities). An important step which was taken was the deepening of cooperation between these organisations and the governments of the Dundaga, Ventspils, and Roja municipalities. The Livonian Union’s general meeting in Irē. There is also no shortage of work during this coming year, which will mark the 80th anniversary of the opening of the Livonian Community House. The celebrations will start this year with a performance at the Community House on May 4th by the choir “Ziemeļmeita” (Northern maiden), which will be visiting from Finland. The main events this year in Irē will be the Livonian Day of Culture on August 2nd and the annual Livonian Festival “Nams. Darbs. Prieks” (Community House. Work. Joy) on August 3rd. Ausma Ernestovska, the head of the Ventspils section of the Livonian Union, stated that its members continue to actively participate in all of the important events in the Livonian community. The Ventspils musical ensemble “Rāndalist” and the folklore group “Kāndla” participated in the Latvian Song and Dance Festival for the first time and took part – as is now traditional for them – in the “Baltica 2018” folklore festival. The Ventspils section began this year by marking the 30th anniversary since its establishment with a special meeting attended by 50 members. The Kūolka section stated that the most significant event for it during the last year was its work leading to the opening of the new Livonian Meeting House in Kūolka. Following the end of tourist season (more than 800 tourists visited the centre from all around the world), work began in August to move into this new space. This work was concluded in February with the opening of the new meeting house, an event, which attracted attention from all around Latvia. A small increase in the membership of the Rīga section was also noted. This is significant and it was felt that even more new members could join this year. There are hopes and plans for how this is to be achieved; however, for now these were not disclosed. The number of members is an especially sensitive point for the Irē section, which has 25 registered members, but only seven of whom are active. However, these seven are extremely active. The official membership of the Livonian Union decreased from 180 to 161 members during the last year. This is also the reason that the acceptance of three new members – Ģirts Gailītis, Teiksma Pobuse, and Rinalds Sīlis – at the general assembly was treated as such especially joyous news.